Jessica Pidsley describes her pregnancy with her firstborn as "peace and war". She was 30 at the time, working as an actor, comedian and writer, and enjoying perfect health in the lead up to her due date. The birth was straightforward and gentle with very little to report. Until the terror set in. 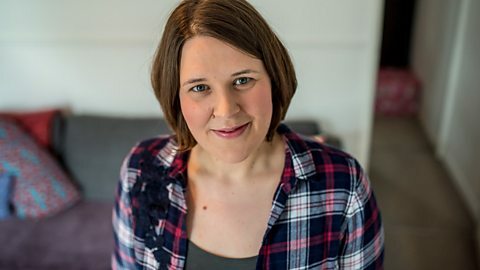 In the Radio 4 docudrama Mama Courage, Jessica speaks out about her experience of postpartum psychosis following the birth of her first child. Jessica with her husband Matt and their two children. Photo credit: Norfolk and Suffolk NHS Foundation Trust. I had heard of postnatal depression before, but I had never heard of postpartum psychosis. The first time I was told the term I knew that it fitted; I didn’t feel like I was falling down the rabbit hole, I felt like I was at the Mad Hatter’s tea party! I was manic and euphoric, with huge surges of megalomania, anxiety, panic and paranoia. Postpartum psychosis does what it says on the tin: becoming psychotic after you have had a baby. Postpartum psychosis is thought to affect around one or two in every 1,000 women, which sounds rare, but there are around 353,000 babies born every day, (according to UNICEF), so that’s a global potential of 353 - 702 women a day that could develop the illness. I had a near death experience. Not a physical one, but a mental one. I could no longer trust my perceptions or my own narrative. In eleven days, I had only nine hours sleep. I had to work impossibly hard to keep hold of the various scraps of “me” in order to avoid being sectioned and removed from my baby, but that felt like a Herculean task. Laced with megalomania, I was undeniably the Buddha. For me, postpartum psychosis manifested with paranoia, delusions of grandeur, hypermania, physical Tourette’s syndrome, panic and terror attacks, extreme sleep depravation, intense distraction and an overwhelming and distressing need to record and document every thought and idea I had. At one point I had so many notebooks and Post-it notes around me I looked like I was sponsored by Rymans! I also experienced moments of deep peace and powerful euphoria, but these were fleeting and laced with megalomania – like thinking my recordings would go viral and make me a YouTube sensation or that I was undeniably the Buddha. How did you come to terms with the experience post treatment? Recovery is a small word with huge implications. It was – and has been – a long, painful, joyful and slow journey, in which I have had to process a lot of shame. By embracing therapy and talking with some fantastic psychiatrists and psychologists I began to relinquish self-punishment and start the process of self-acceptance. I found that one of the hardest elements of recovery was practicing compassion. Compassion for what I, and my family, had suffered and learning to be patient and kind to myself, rather than feeling ashamed of what the psychosis had made me say and do. Because the illness hijacks your mind and body, it is a very complex and sensitive process to realign your sense of self and heal the wounds you inflicted upon yourself. I would deliberately name the psychotic elephant in the room. So many people still find it very awkward and don’t want to talk about it. I found the silence around it made me feel more ashamed. I would deliberately name the psychotic elephant in the room, because I refused to feel like it was something that should be whispered about. This is why, when I got back from the Margaret Oates Mother and Baby Unit, (The Hackney Holiday Home as I liked to call it), I was determined to write about my experiences. I wanted to share it with others going through similar illnesses and to start putting together the jigsaw of my own fragmented memories from those months. Once back at home with my husband, Matt, and our four-month-old son, I committed to writing a blog a week under the pen name Mutha Courage. It was from these blogs that the producer Karen Rose got in touch to talk about us making a drama-doc for BBC Radio 4. This was an enlightening process. Matt and I had both been through huge post-traumatic stress, but also experienced incredibly transformative post-traumatic growth, which has led us to where we are today. I made this picture in one of the classes at the Margaret Oates Mother and Baby Unit. Art was just one of the ways the brilliant staff helped us heal and see the beauty within the chaos. How would you give strength and courage to those currently suffering? What I would say to anyone suffering from any mental health illness is that you contain more strength and courage than someone else can ever give you.Mental illness means that you are ill and being ill means that you can get better. Leaning into the discomfort of these experiences and being willing to meet yourself is an incredible privilege. It is the hardest, but most profound work I’ve ever done. Photo credit: Norfolk and Suffolk NHS Foundation Trust. Mental illness means that you are ill and being ill means that you can get better. The compassion and love that others want to give you is immense. Let it in. Even if that feels like the biggest risk you could ever take. Take it. You are worthy of love even if you don’t think you are. Surround yourself with people that make you feel positive and loved and the best version of you and just be civil to the rest. You deserve good things. What people often don’t talk about is how incredible living with, through and beyond these illnesses can be. It gives huge insight and a capacity to appreciate and understand others and empathise wholeheartedly with the suffering, hopes and joys of fellow humans. To hear the full story of Jessica's journey, from the highest of highs to the lowest of lows, listen to her Radio 4 docudrama Mama Courage. A look at postpartum psychosis, a rare form of post-natal depression. The experience of postpartum psychosis and its aftermath. Comedian Lou Conran on losing her baby.